2) Greater than First Layer Problems - if you nail the first layer, it goes down nice and smooth without significant artifacts predictably and reliably but are seeing issues in the second or higher layers, this is almost always related to a mechanical problem and not a slicing problem. Think about it, once the first layer is down it has created a "raft" for the next layer and the top surface of that raft should be precisely parallel at any point on the surface to the nozzle tip's motion. In other words, the next bead should go down perfectly. If not, start with the nozzle itself. Polish the tip, check the bore to make sure it is round and has no burrs or significant scratches in it (hold up to light and look through). If you have a spare nozzle, polish it up and try it. Once the nozzle has been eliminated (and nozzle issues would also be prime suspects for #3, #4 and possibly #5) next check the hot end itself. Make sure it is tight with NO WIGGLE whatsoever. One easy test is to re-orient the hot end in its holder (rotate it 90° or 120°) and test print. Does the issue show up in exactly the same place? If so, it is not the hot end, if not, then you have narrowed it down a bit. Don't forget to use the slicer rotate feature to rotate the part, say 90°, and test. The results of this can help determine which axis of motion (typically X or Y) might be contributors. Think about the Cartesian geometry and how artifacts in the part relate to that geometry. Most of the time, a defect will be aligned with either X or Y and that provides valuable information on where to check. Artifacts that are not aligned most likely have contributors from both the X and Y axis motion. This is a powerful realization as it allows you to start thinking about the relationship of the printer axis movements to the part geometry. For instance, if you have print artifacts that are precisely aligned with the Cartesian Y axis no matter how you rotate the part or hot end, that should be screaming "There is a problem along the Y axis mechanical path." Don't forget the belt, stepper pulley and idler pull at the top. A small piece of debris on these parts can cause the belt to stretch slightly as it goes around the pulley and this can result in a print artifact. A good thing to do is to clean everything carefully (I use Windex and clean lint-free paper towels) and re-test. It is also a good idea to tighten the pulley grub screws - I can't tell you how many times that has been the issue. If you can't determine an alignment with X or Y, try rotating the part in your slicer and rechecking. Move the part closer to the "0" end of the bed and the maximum end of the bed on both the X and Y axes and reprint and check. This is why I like a simple, small part to test - you might be making a lot of prints and you want to get the data as quickly as possible. If you discover a relationship, investigate the suspect axes for misalignment, loose belts, backlash, etc. One technique I use is to apply pressure from my finger on the extruder mount aligned with the direction of the suspect axes while it is printing. First towards "0" end then towards "max". This eliminates backlash in the system and can help identify issues. You can do both directions on a single print so you get a twofer on this test! 5) Fill Problems - fill problems are more unusual and are almost always a slicing issue. Once you have the first layer and perimeters nailed, squirting the plastic inside to fill the part is usually not a problem. Overfilling that causes bulges in higher layers can be an issue. This can be addressed with calibrating the extruder, filament extrusion temperature, infill extrusion width and even infill density. I'm hoping this is relevant and I will get some more videos up when I can. Here is a slow motion video of how structural flexing due to high accelerations can cause slight harmonic motion in the nozzle that will show up as a ripple in the layer. Because the harmonic is generally the same the rippling appears to follow the curvature of the perimeter. The perimeter itself is not the cause of the artifact but the structural flex that is induced from the forces created from the nozzle and bed changing directions. Notice how the harmonics begin at maximum acceleration--directional change--and stabilizes at minimum acceleration--the middle of the run. Although not applicable to everyone I hope this gives a little more insight into how some types of mechanical artifacts can be created. Very cool! Thanks for the video! Thanks for the awesome writeup. Do you have an image showing the anatomy of the parts you describe cleaning for pulley maintenance and things like the pulley grub screws, stepper pulley and idler pull. I've got a "Greater than First Layer Problem" I'm troubleshooting at viewtopic.php?f=36&t=2787 - if you have a spare cycle to take a look and offer your $0.02. Btw, I love your 3D "Printed Tenkara Line, Leader or Tippet Spool" - I'm a trout fisherman up here in Minnesota. caylan, I'm happy to take a look so post your stuff. I'm on the road this week and not home with my printers. I'll take some photos this weekend and post here. Thanks to a fellow angler. Have you seen my 3D printed fly reel? You can print one of your own. Check out the video that Field & Stream did on the reel I printed for them. Brew4You, thanks for this amazing video!! I was trying to get behind the ripple after corners on the outer shells and I supposed such a movement but without slow motion I was not able to see it on my TAZ. Can you confirm that it's the print head which is doing a up and down bouncing movement, and the print bed is stable? The question is, what can be done against this, it would realy improve print quality if we could stop that. Up to now, I have no idea why the forces caused by a direction change on X axis results in a up and down movement. A woble along X axis caused by the flex of the drive belt would be more logical to me..
That is a great question. I'm going to say that both the bed and extruder are flexing. I have no system in place to measure what components are doing what. I will make a couple of educated guesses based on my limited knowledge of physics and materials. The X-axis is probably the biggest culprit of flex in the system. Albeit the bed has more mass the lever arm of the extruder assembly is much larger. The engineering of the X-axis has more weak points compared to the Y-axis. Think of the distance between the bearings--the lower rail on the X-axis only having one--and the distance between the rails on the X-axis compared to the Y-axis. There are plenty of people on this forum interested in using some type of v-rail system for the X-axis to combat flexing of the extruder. Others want to make this upgrade because the rails dip down enough from the weight of the extruder assembly that it messes up their prints. All of this babbling leads to your 3rd question. I'm going to say that the GT2 drive belts are rock solid and are as close to a non-factor as any component can be. The biggest issue is that the stepper motor and the belts are on one side of the rails and the extruder stepper, nozzle, gears, plastic everything, and fan are on the other side of the rails. This creates a torque on the assembly anytime the X-axis stepper accelerates the printhead assembly. It's probably a gross oversimplification to say that the nozzle moves up and down. I hope that I did not mislead you into thinking that. The flexing is most likely some sort of orbital harmonic. This means that the ripples can be cause by the nozzle moving back and fourth in arcs, a little bit up and down, side to side, back to front. If the extruder is laying plastic at a constant velocity and the nozzle slows down what happens? The layer will get a little thicker. If the nozzle speeds up? The bead of plastic will thin out. To quickly scale up the complexity of the issue of flex lets successively move outwards in the system from the extruder assembly and the X-axis. There will be flex in the X-axis to Z-axis mounts, Z-axis rails and jack screw. There will be flex in the frame in X-axis direction and in the Y-axis direction as well. If you stiffen up one part of the system it does not get rid of the force that causes the flex, it merely transfers it to a different component--a little bit of flex everywhere is good think of a bridge. This leads the 2nd question. The best way to improve print quality is no different in this situation, slow down. Keeping the acceleration setting low will drastically increase printing times but will keep forces like momentum and impulse to a minimum. Thus, making your prints smoother and reducing the wear and tear on your machine. LulzBot makes awesome printers and they are very high quality and produce amazing things but there is a reason industrial machines are insanely expensive. They are built to run at the absolute max constantly. I've replaced almost every piece of ABS plastic on my TAZ with nylon because I've shattered most of them running my machine like this. At this point I can't say that I've made up any time because speeding up the prints has been negated by the down time of not only replacing broken parts but spending the time to print them out. I run high speeds and accelerations because I consider this a hobby and I like to see if the TAZ can handle doing things the LulzBot team never thought it could do but it hasn't saved me time or money. At first I thought it was a Z Offset problem, then It turned out I could eliminate those ripples completely by loosening the extruder idler tension screws just a little bit (like 1/2 turn). ...and the ripples came back if I loosened the screws further (weird, no?). 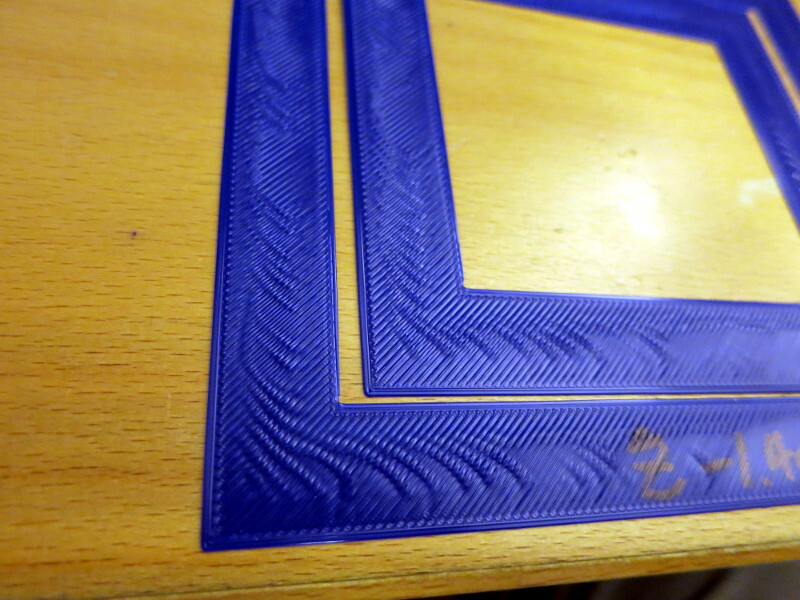 I can understand how a too-loose extruder idler could cause patterns like this - less or more extrusion based on how much the reel is pulling on the filament - but I haven't figured out a reason why a slightly-tight extruder idler should cause very similar ripples.